Wanting to add some variety to my SciFi movies this year, I decided to include some kid friendly movies because why should scifi be restricted to adults only. A quick internet search led me to a long list of kid friendly SciFi movies and my biggest problem then became picking which ones to watch. 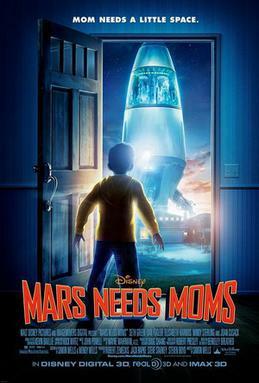 Among these many movies listed, I spotted Mars Needs Mom and thought what the heck, why not start with this one. I honestly had no idea what to expect. I remember seeing it advertised a few years ago when it first came out, but back then I didn’t really have any interest in seeing it. So I went into this one only knowing that it involved aliens from Mars kidnapping moms from Earth. It seemed like a pretty straight forward idea. To be perfectly honest, I figured this would be a silly movie, as so many kids movies tend to be regardless of genre, but to my surprise I really enjoyed this one. The overall story as a whole was an interesting one. I was curious as to why exactly the martians were stealing moms. I mean, obviously it was because the needed moms, as the title of the movie states. But why? How could an entire alien society need moms? Were there no alien moms? And if so, why as that? So many questions to be answered and the movie does a great job of explaining all of it. It takes a little while to get to this answer, but if it happened too quickly then there wouldn’t be enough left to show to have a full length movie. I thought the animation in this movie was pretty good. Motion capture is definitely one of those great animation tools that I don’t feel is used often enough, though I realize plenty of movies do take advantage of it. Getting to see the actors in their motion capture suits acting out certain scenes was a nice bonus at the end of the movie. I found it interesting to have mars aliens living underground and thus the rovers never find evidence of their existence. There is plenty of humor scattered throughout the movie, especially whenever Gribble was involved.I found myself laughing at several points and it just made the whole experience that much more enjoyable. But it wasn’t all humor, as there were a number of serious moments as well. I did have a couple of issues with this movie. First was the many scenes where Milo, and one occasion Gribble, end up falling a really long way down and then land in a pile that basically consists of metal and not a single injury was seen. No scratches, bumps or bruises. Even with the lesser gravity on mars, there should still have been some negative repercussion from these drops, especially since they happened a number of times. Secondly, I had a slight issue with the whole alien falls in love with a human thing. I felt it was completely unnecessary to the movie. I didn’t care that Gribble decided to return to mars, but why did it have to be because he’s in love with Key, the female rebel of the aliens. Overall a great little movie that would be perfect to watch as a family, as kids and adults are sure to enjoy it. This entry was posted in Childrens, Movies, Science Fiction and tagged Childrens, Movies, Science Fiction. Bookmark the permalink. I remember when this came out and i felt so “meh” about it and never saw it. I think part of it was that I didn’t really like motion capture, so maybe I should give this another try. I felt the same way, figuring it would waste my time and not be good, but honestly, it’s worth checking out.